OnePlus 6 has been launched in India, at an event on Thursday in Mumbai, alongside the OnePlus 6 Marvel Avengers Limited Edition variant. The smartphone was unveiled globally in London on Wednesday, and the company gave the world its first glimpse of the OnePlus 6 Marvel Avengers Limited Edition at the smartphone's launch in China earlier today. The company's latest flagship smartphone brings forward several staples from its stable, but it also has some new things to offer - most notably, the OnePlus 6 features an iPhone X-like display notch, and is also the first all-glass OnePlus smartphone. The smartphone is also the first from the company to offer a 256GB inbuilt storage variant. At the launch event, OnePlus announced it would be opening five new OnePlus Experience stores in India this year, as well as 10 new service centres. The company also launched the OnePlus Bullets Wireless earphones in the country, which will become available next month. OnePlus 6 price in India starts at Rs. 34,999 for the 6GB RAM/ 64GB storage variant, while the 8GB RAM/ 128GB variant is priced at Rs. 39,999. There are three colour options - Midnight Black (only available for 8GB/ 128GB variant), Mirror Black (available for 6GB/ 64GB and 8GB/ 128GB), and Silk White Limited Edition (only available for 8GB/ 128GB). The OnePlus 6 Marvel Avengers Limited Edition price in India has been set at Rs. 44,999. A regular colour option for the 8GB RAM, 256GB storage variant will not make its way to India, the company confirmed to Gadgets 360. The OnePlus 6 Marvel Avengers Limited Edition will become available in open sale from Amazon on May 29. The Silk White variant will be made available from June 5 in an 8GB RAM/ 128GB configuration, the company said. As for the OnePlus Bullets Wireless price in India, it has been set at Rs. 3,990. No exact release date has been provided for the earphones. The regular OnePlus 6 colour options will go on sale via pop-up stores across 8 cities in India - the stores will be open between 3:30pm and 8pm on May 21 and between 11am and 7pm on May 22. They will be established at High Street Phoenix in Mumbai, Phoenix MarketCity in Pune, The Forum Vijaya in Chennai, The Forum Sujana in Hyderabad, DLF Place Saket, Delhi, South City Mall in Kolkata, Gulmohar Park Mall in Ahmedabad, and OnePlus Experience Store, Brigade Road, in Bengaluru. 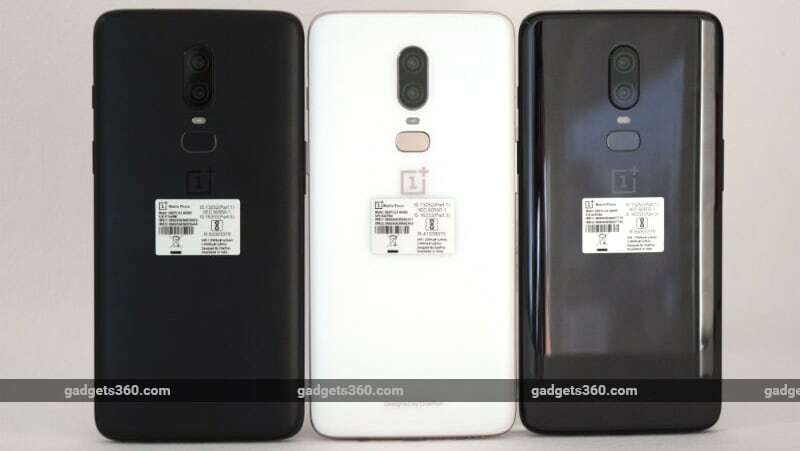 Online, the OnePlus 6 will become available in India via Amazon India in an Early Access sale for Amazon Prime members on May 21, and become available to buy in an open sale from May 22. It will also be available to buy via the OnePlus Store in India. Those who pre-booked the smartphone during the Fast AF Sale on Amazon India will get additional benefits - 3 months extended warranty and Rs. 1,000 Amazon Pay balance cashback - over and above the regular launch offers. As for the regular OnePlus 6 launch offers, customers purchasing the smartphone through SBI credit and debit card transactions will get a Rs. 2,000 discount. This will be available during the first week. Further, customers will also be eligible to avail no cost EMI options for up to three months through all popular banks. OnePlus is additionally giving all OnePlus 6 buyers complimentary 12-month accidental damage insurance by Servify, an Amazon Prime Video gift card worth Rs. 250, and discounts up to Rs. 500 for purchasing ebooks via Amazon Kindle. Idea subscribers picking up the OnePlus 6 will get Rs. 2,000. cashback and a dedicated device insurance. OnePlus also also announced benefits up to Rs. 25,000 will be available on flight and hotel bookings from ClearTrip. The OnePlus 6 Marvel Avengers Limited Edition smartphone was also launched alongside the regular variants. 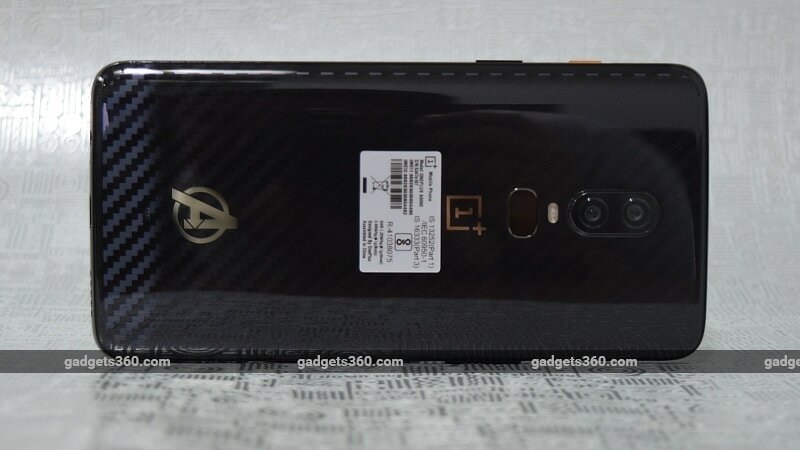 Besides offering the top-spec for RAM (8GB) and storage (256GB), the special edition smartphone comes with a carbon fibre texture below its Gorilla Glass 5 covering, as well as gold OnePlus and Avengers logos on the back panel, and a gold hardware Alert Slider. 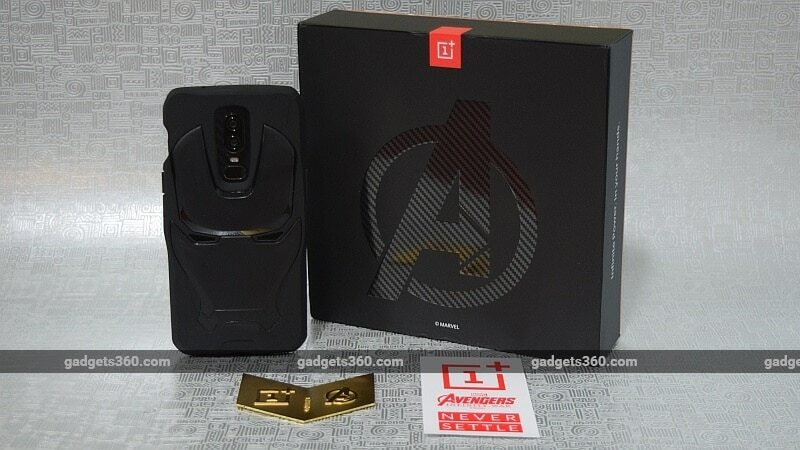 In the box, the OnePlus 6 Marvel Avengers Limited Edition ships with an Iron Man protective case, and is bundled with a random Avenger medal (one of six, that combine to create the Infinity Medal). Five Avengers wallpapers will be included. The dual-SIM (Nano) OnePlus 6 runs OxygenOS 5.1 based on Android 8.1 Oreo, and an Android P Beta build was initially said to be available for the handset from May 16 itself, but at the launch, OnePlus Co-Founder Carl Pei announced it will be available download from the company's site in the "next couple of days." The OnePlus 6 sports a 6.28-inch full-HD+ (1080x2280 pixels) Full Optic AMOLED display with a 19:9 aspect ratio and an 84 percent screen-to-body ratio, protected by Gorilla Glass 5. It supports sRGB and DCI-P3 colour gamuts, just like the OnePlus 5T. It is powered by a Qualcomm Snapdragon 845 SoC clocked up to 2.8GHz, coupled with either 6GB or 8GB of LPDDR4X RAM and an Adreno 630 GPU. The dual camera setup on the OnePlus 6 is similar to the one seen on the OnePlus 5T. It has a primary 16-megapixel Sony IMX519 sensor with a 1.22-micron pixel size, f/1.7 aperture, OIS, and EIS. The secondary 20-megapixel Sony IM376K sensor has a 1-micron pixel size and an f/1.7 aperture. The rear cameras are supported by a dual-LED flash module. A Smart Capture mode for automatically optimised camera settings will be available. HDR and Portrait Mode make their return as well. The OnePlus 6 sports a 16-megapixel front camera with a Sony IMX371 sensor, 1-micron pixels, f/2.0 aperture, and EIS. OnePlus is touting Slow Motion video recording, capable of capturing 480 frames per second at 720p for up to a minute. It can also record 240fps at 1080p. There is also a new in-device video editor. The front camera now offers Portrait Mode as well, using a new AI algorithm to give a depth-of-field effect. The Face Unlock feature on the smartphone said to unlock the smartphone in as little as 0.4 seconds. The OnePlus 6 will be available in three storage variants - 64GB, 128GB, and 256GB - none of which are expandable via microSD card. Connectivity options include 4G VoLTE, Wi-Fi 802.11ac (dual-band, 2.4GHz and 5GHz) with 2x2 MIMO, Bluetooth v5.0 with aptX and aptX HD support, NFC, GPS/ A-GPS, USB Type-C (v2.0), and a 3.5mm headphone jack. Sensors on board include an accelerometer, ambient light sensor, digital compass, gyroscope, and proximity sensor - it bears a fingerprint sensor on the rear panel, said to unlock the smartphone in as little as 0.2 seconds. The OnePlus 6 runs on a 3300mAh battery with the company's Dash Charge (5V 4A) fast charging technology that said to deliver a "day's power in half an hour". The smartphone measures 155.7x75.4x7.75mm in dimensions and weighs in at a hefty 177 grams. The OnePlus 6 also offers 'daily water resistance', said to be safe from regular splashes and rain. The company says the OnePlus 6 has "special type of foam layered on the gap between the screen", a battery cover to prevent water from seeping into the wiring, as well as waterproof materials in the headphone jack and fingerprint scanner. However, the OnePlus has not detailed an IP rating, instead specifying users should not take it out for a swim.